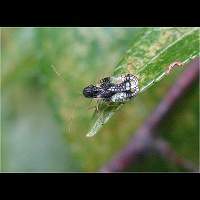 The Andromeda Lace Bug belongs to a rather small family of beautiful, rather curious bugs. In the wings are numerous larger or smaller transparent places. Therefore they make the impression being made of lace, a net or leaded window. Some species also carry enormous thickened antennae. 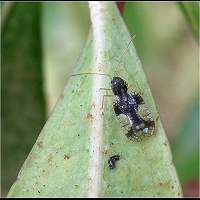 Most species are some 3 to 5mm long. 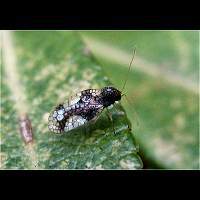 The Andromeda Lace Bug also is a very small species. When seen with the naked eye one sees a small black and white animal. Only looked at through magnifying glasses or by taking a macro picture will the true beauty be revealed. This species was discovered in Europe for the first time in a private garden in the Netherlands in 1994. In the years that followed it was discovered in many other countries as well. First seen in Britain in 1994. 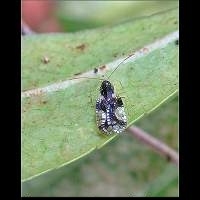 The Andromeda Lace Bug originates from Japan and the Himalayas and was discovered as a separate species in 1956. It leaves a secritive life and because it is very small indeed, goes about unnoticed, especially when occuring in small numbers. The eggs are being laid in late summer. They are deposited in small punctures in the leaf near the main vain. Each egg is deposited separately and the hole is closed by droppings. After hibernation the larva hatches and starts sucking on the leaf. It runs through five instars in a period of one to three months before becoming adult itself. It is said this species may infest Andromeda species, Pieris species, such as Pieris japonica, Azalea and Rhododendron. In our garden it is only seen on the Pieris. Azalea and Rhododendron close by are uninfested apparently.